In March, we announced details of the new Continuous Certification Program. 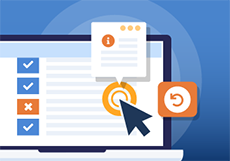 A main feature of the program is an online, open-book assessment to be taken every other year, which will gradually replace the traditional recertification exam. This new assessment is being introduced in 2018 for general surgery, with other ABS specialties launching over the next few years. More information regarding other specialties will be available later this month. The general surgery assessment will consist of 40 questions: 20 on core surgery; 20 on a practice-related area. For 2018, diplomates will be able to select from four practice-related areas: general surgery, abdomen, alimentary tract, or breast. More areas are planned for the future. Topics and references will be published in advance. Diplomates will take it on their own computer at a time of their choosing within the assessment window. Once started, they will have up to two weeks to complete it, with the ability to save and return. Diplomates will receive immediate feedback, and will have two opportunities to answer a question correctly. If unsuccessful, the assessment can be retaken the following year without affecting certification status. General surgery diplomates with certificates expiring this year can use the new assessment to continue their certification. Diplomates will not be required to take the assessment until their certificate is due to expire. To register for the assessment, diplomates must be up to date on meeting other Continuous Certification requirements (CME, etc.). As part of the new assessment, surgeons whose general surgery certificates have lapsed are invited to regain their certification through a special pathway. This pathway will only be available for three years: 2018, 2019 and 2020. See our policy for details. Registration for the general surgery assessment will open Aug. 1. The assessment will be available this fall from Sept. 7 to Nov. 5. While the traditional format for the general surgery recertification exam will be offered this year, diplomates who choose this option will still be required to begin the new assessment process by 2020. For more details, see the Continuous Certification area of our website, as well as our overview video and summary pdf. Check your status anytime by logging into My Continuous Certification. 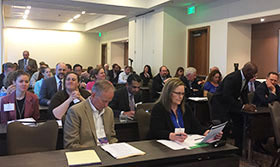 The Vision for the Future Commission convened by the American Board of Medical Specialties is seeking feedback regarding the current and future state of continuing board certification. The commission has created a survey to collect input from as many stakeholders as possible. The deadline to respond has been extended to May 11 - we encourage all diplomates to add their voice. More information about the commission can be found at visioninitiative.org. We will be sending all diplomates a survey regarding the ABS Continuous Certification Program later this month, to gather feedback following the program's rollout earlier this spring. Please keep an eye out for the email. We are working on additional ways to help diplomates promote their ABS certification, including new brochures coming this summer. Stay tuned! 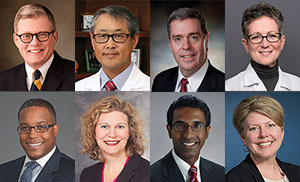 New ABS directors (clockwise): Dr. Barnhart, Dr. Chen, Dr. Dent, Dr. Goldberg, Dr. Larkin, Dr. Mammen, Dr. Minter, and Dr. Stewart. The ABS' component boards and advisory councils will also have new members joining them in July. The ABS has been investigating the use of Entrustable Professional Activities (EPAs) in general surgery residency as a way to move toward competency-based education. EPAs have been defined as, "A unit of professional practice that can be fully entrusted to a trainee, as soon as he or she has demonstrated the necessary competence to execute this activity unsupervised." The two-year pilot will start this July, with 28 community and academic programs participating. Through the pilot, we hope to learn more about the feasibility of incorporating EPAs into residency training, and how EPAs compare to current assessment paradigms. The Check a Certification feature on the ABS website receives 24,000 visits per month. More than 400 surgeons volunteer their time and expertise every year to the ABS, as exam writers, oral examiners and more - thank you! ABS directors volunteer 30 days per year for six years. All ABS directors participate in Continuous Certification. ABS fees are among the lowest of the surgical certifying boards. Several surgical societies have issued statements or guidelines in support of continuous certification, including SSAT, APSA, SAGES, ACS and SVS. Diplomates not receiving ABS E-News should check their email address and communication settings under update personal information. Other individuals should use our sign-up form.